Thanks, Terence. Do you see a way to get this message to these rap artists? How did they get so out of touch with the historical black counter-frame to racism? I feel that regardless of personal contact, many would still ignore what is right in front of them due to the distraction of the almighty dollar bill. I hate the fact that rappers feel that because they are in a occupation that is so open that they can speak on topics in their lyrics that are still considered very touchy for those in the black community. I’ve heard the song karate chop and the part of the song when Lil Wayne refers to Emmitt Till, I had to stop the song and rewind to make sure he was saying what I thought. 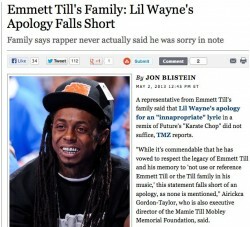 Don’t get me wrong, I like Lil Wayne but I think he is clearly crazy. Maddie, iagree with you. I since the current disconnect from history has allowed this type of behavior to manifest. Great post. I was wondering if there is a comparison to make between the rappers of today like Lil Wayne and black entertainers of the past, such as minstrel performers like Bert Williams, or comedians like Cosby, Pryor, Rock, etc. Is it simply a matter of appealing to a predominantly white audience to earn a living? Depressing for sure, but have we gained no ground whatsoever? Thank you John for your comments. I think you present a valid point. There seems to exist a common trend. But at the same time I since today this sort of behavior is more accepted by people of color due to a number of factors.